Christmas is a time of joy and merriment. It’s also a time when businesses take advantage of the holiday spirit by hosting Christmas-themed events and promoting product and service gift ideas to shoppers. 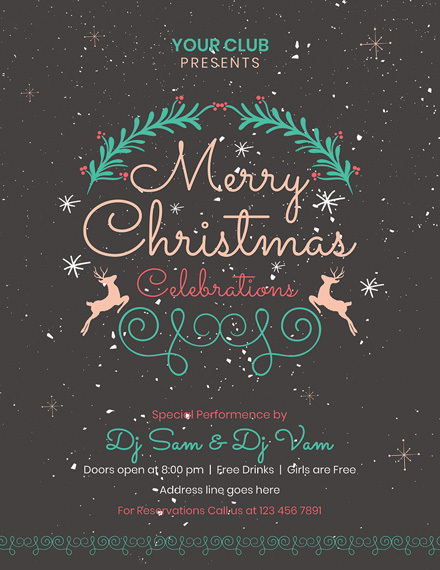 Given how hectic the holidays can be, standing out with a simple yet impactful Christmas flyer is sure to grab a person’s attention. Learn how you can keep your flyers festive by reading along. To design a flyer that is not only effective but a clear representation of your business as well, there are a few elements that should always be included and applied correctly. 1. A Concise Goal: What’s your purpose for designing the flyer? Perhaps you want to invite people to your club for an annual Christmas gathering, or maybe there’s a mall-wide Holiday Season sale you want to promote. Your flyer design shouldn’t make people think twice about what you’re trying to advertise. This must be made clear and specific with a single glance at your flyer. 2. A Compelling Headline: A popping headline has the ability to turn heads. It’s most likely to be the first thing people will read as soon as their eyes land on your flyer. Aside from making it stand out with big, bold text, the copy of your headline should be good enough to pique one’s interest. It can be anything from a fresh company tagline to a limited offer that’s hard to resist. 3. A Motivating Message: This is where your call to action should be made apparent. This is a message that teaches readers how you want them to react. Words like Buy Now, Contact Us, Enter to Win, Call Us, and Visit Our Website are just some examples of a good and direct call to action. Keep in mind that your message can greatly influence how people are bound to respond to your promotional flyer. 4. Graphics: The visual aspect of your flyer holds a high value that should never be ignored. 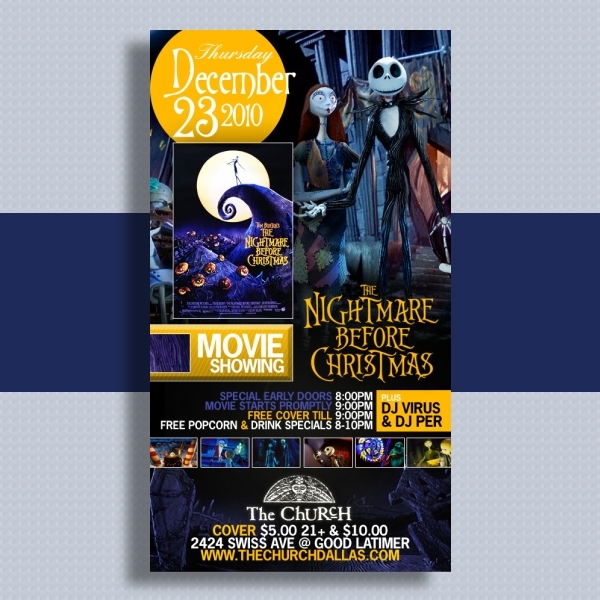 Christmas flyers are usually vibrant and colorful to stay relevant with the season. 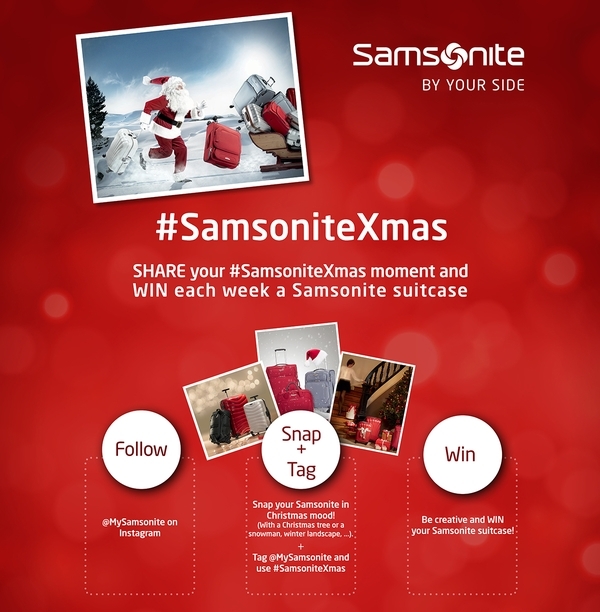 In addition to Christmas-themed colors, it can also include characters and illustrations that may be associated with the holiday. High-resolution images of your product or service offers can also be included when necessary. 5. Contact Information: How else will clients and customers be able to reach you when they don’t have your contact details to start with? As an essential part of any business medium, the flyer must present your contact info such as your name, address, phone number, website URL, and social media pages. This must be made visible from a distance so it wouldn’t be hard for people to find. While a flyer might seem like a simple piece of paper with a print on one or both sides, it’s also a valuable advertising tool that can capture one’s attention—that is, if you do it right. There’s no such thing as the “perfect recipe” when it comes to crafting a business flyer, but there is a way to break through the clutter and make an impressive difference. Gather your team and start putting all your ideas together. It doesn’t matter how bizarre your imaginations can get, as some of the best flyers can come from the most unusual ideas. A long list of items might be a lot to go through, but you can always sort things out once you begin reviewing your list later on. 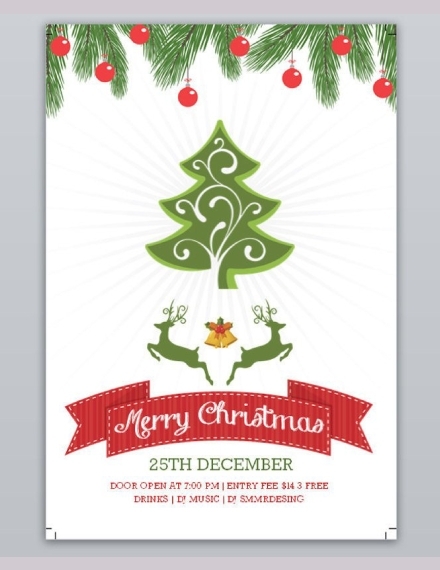 By now, you should agree on a great headline and visual for your Christmas flyer. But this is only a small part of a bigger battle, you still need to improve your concept to make it stand out. Figure out how you can enhance the look and feel of your flyer by looking beyond its visual element. Maybe there’s a way you could make the flyer smell like peppermint, or you could try using a different paper material to awaken one’s sense of touch.You may also see party flyer examples. 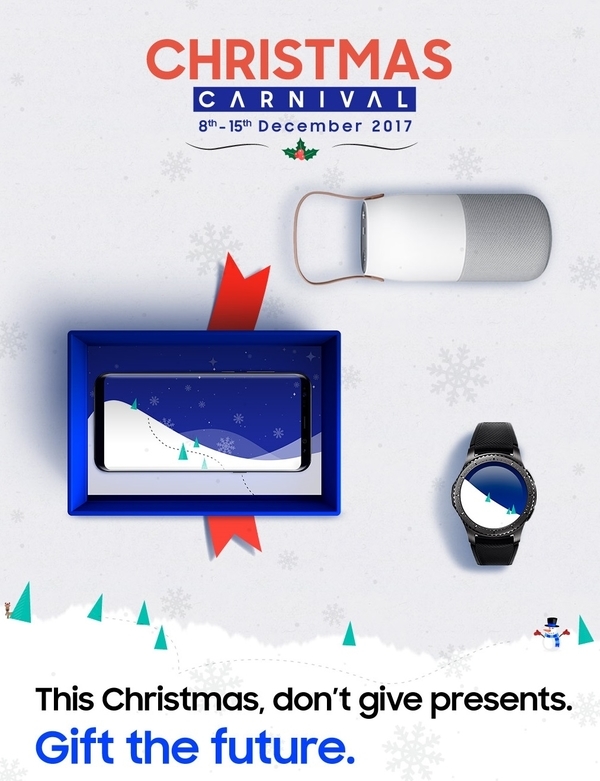 Christmas flyers should be festive as opposed to sales-y. 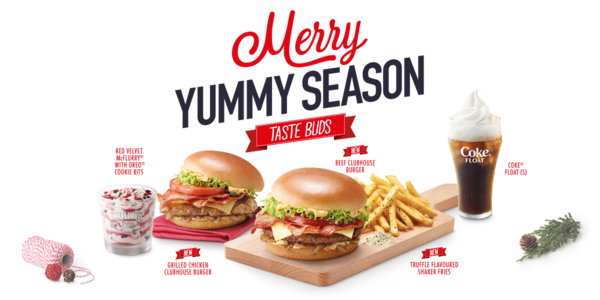 As much as you want to make a pitch with customers, a holiday flyer that’s all about business and nothing about the season itself is easy to ignore. It’s important to have a great offer that buyers can benefit from during a time of gift-giving. 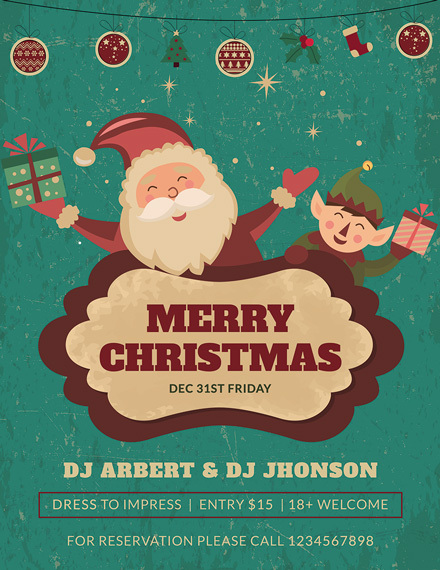 Make sure to add graphics that support this message and complement the overall look of your flyer design. The placement of each flyer element is not something you’d want to mess up. That’s because cluttered layouts tend to be difficult to read and easy to dismiss. It’s a good idea to use negative space to organize your layout and help make both your headline and offer stand out. Avoid overcrowding typography and adding too much copy. A simple design will go a long way when applied correctly. 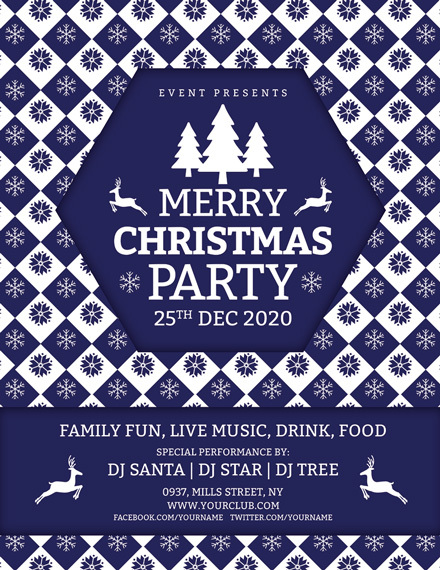 Unless you plan on publishing your flyer online and sending it to subscribers of your email newsletters, ensure that your Christmas flyers meet the necessary printing requirements. This includes a CMYK color model, paper bleed, along with the overall printing quality of the material. Since you’ll need more than a dozen copies of the flyer for distribution, be sure to order them by bulk or have them produced by a long-time printing partner to get bigger discounts.You may also see holiday flyer examples. Function before form: Designing the flyer is probably the most exciting part of the process. However, you need to get your priorities in line first. A visual masterpiece will be nothing without a clear purpose. Shoppers are easily distracted during the holidays, so it’s important to make a flyer that’s striking enough to be picked up and looked at. The information on the flyer has to be specific enough to convince prospects to respond in the way you want them to. Use a grid: When it comes to flyers, you’re forced to work with what you have. Fortunately, you can maximize on space by using grids to attain a minimal, subtle, and calm layout. Most editing programs feature a grid option that you can apply to your layout space. This serves as a guide for you to scale text and graphic elements to an appropriate size and position. 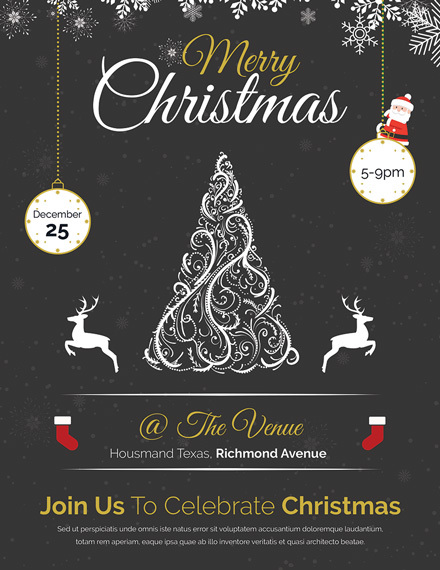 Be approachable: A grumpy grinch with a frown on his face isn’t exactly the best character to have on a Christmas flyer. It’s best to paint a friendlier picture with an image of a happy family, a loving couple, or even illustrations of Christmas ornaments and the big guy wearing his red suit. Keep in mind that making a good impression is vital to the success of your flyer, so be sure to use photos that don’t look corny or forced. Set the mood with color: Color plays a key role in making your flyer seem bolder and more approachable. This defines the mood and personality of your design in order to evoke the right emotion from viewers. This should be enough to entice readers and prompt a desired response. You can also learn more about the meanings of these colors by studying color psychology even further.You may also see church flyer examples. Make it a keeper: Flyers are inexpensive to produce due to their low-weight paper and unfashionable gloss finish. But because flyers have become a common marketing device for small businesses, you can find one almost everywhere. Some are forgettable, others are thrown away without a chance. Thus, it’s important to craft a flyer design that’s worth keeping. Something that they might not use today, but in the near future. Anyone who has used a printer or copy machine would know that a 8.5-by-11-inch material is the most ideal size for any type of flyer. It’s a suitable size for posting on a bulletin board, hanging on a store window, and handing out to random passersby. 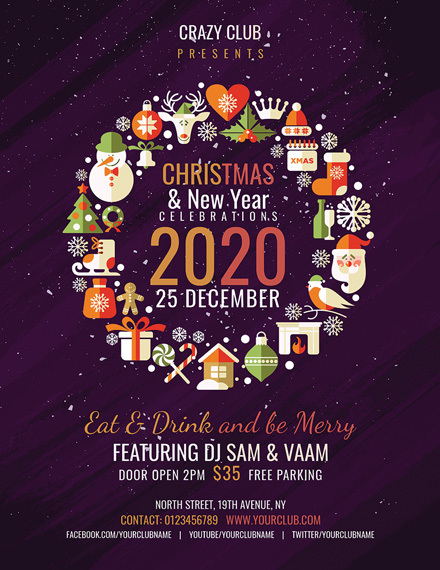 There’s enough space to include important business or event information, such as dates, hours, and locations, especially if you’re making a Christmas party flyer. Little handouts like these are perfect for pinning to your refrigerator or fitting into your purse for a later read. You can turn a standard printer paper into a 5.5 inches by 8.5 inches flyer, or divide into fourths to develop a 4.25 inches by 5.5 inches flyer. These aren’t like your average kind of flyers, as they can only be produced by a professional printing service as opposed to a home or office printer. These 11-by-17-inch poster-size flyers are a great way to make a bold impact with your audience. This can be used to announce upcoming events and sales for potential customers to notice. Like any other event poster, the flyer should display important event details for viewers to be fully informed. 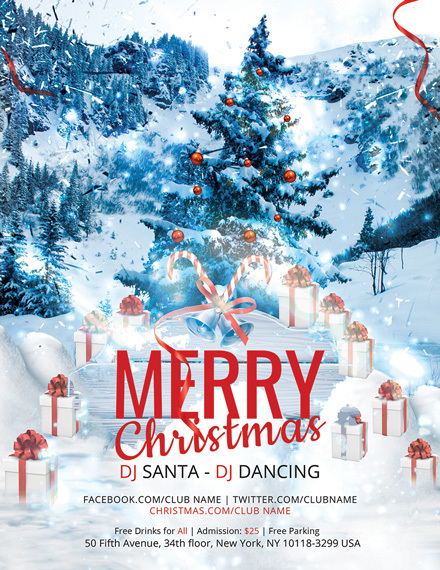 How can I make a Christmas flyer? Not everyone is too keen about starting from scratch. So if you’re in a hurry, consider using a flyer template instead. You can easily customize the flyer to meet your requirements and have it printed in the correct format. Since templates can be pretty generic in form, be sure to personalize your flyer to help enforce your brand and garner attention. 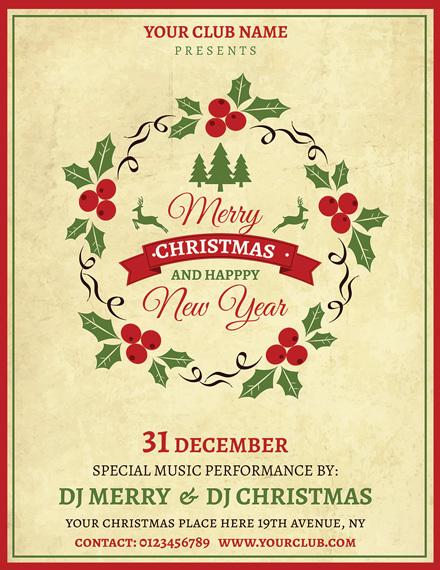 What is the purpose of a Christmas flyer? 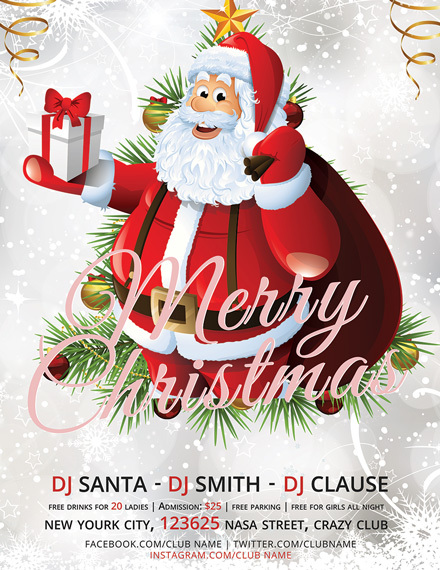 A Christmas flyer is a form of print advertisement intended for wide distribution. This can be handed out to individuals in a public place or sent through direct mail. 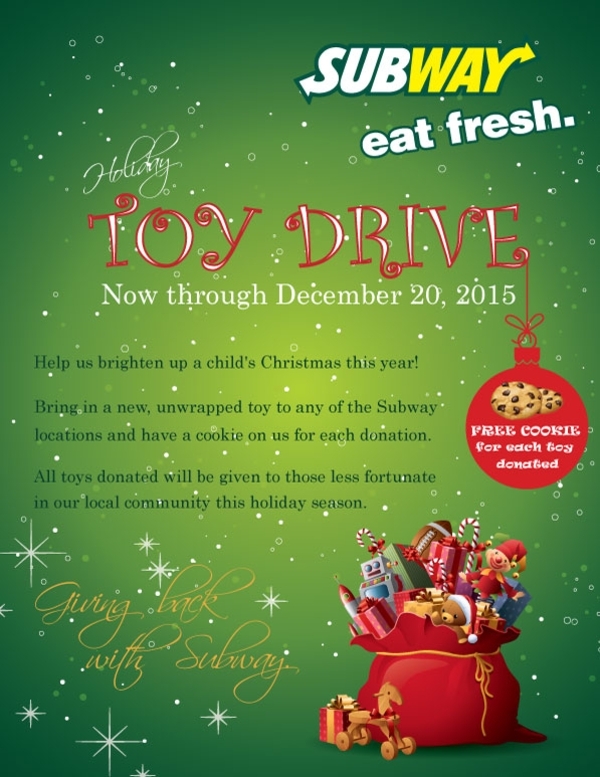 During the holiday season, using flyers prove to be an effective means of marketing due to its function and reach. This allows you to get your message across without much effort. So there you have it! 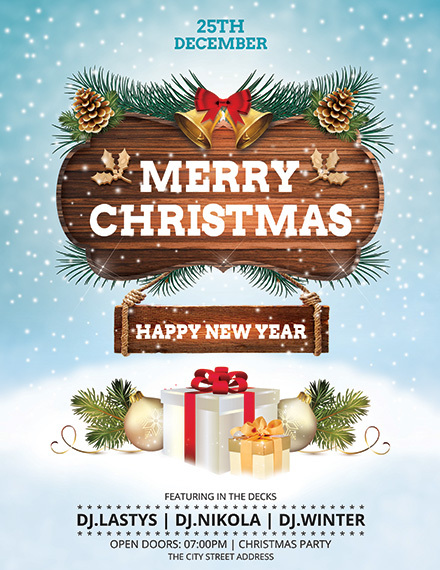 Celebrate the season with a touch of creativity with the help of these flyer design ideas and templates.